Senior Austin Keberlein steps into a forehand in his singles match against McPherson College on Feb. 25. Photo by Alex Fortuna. 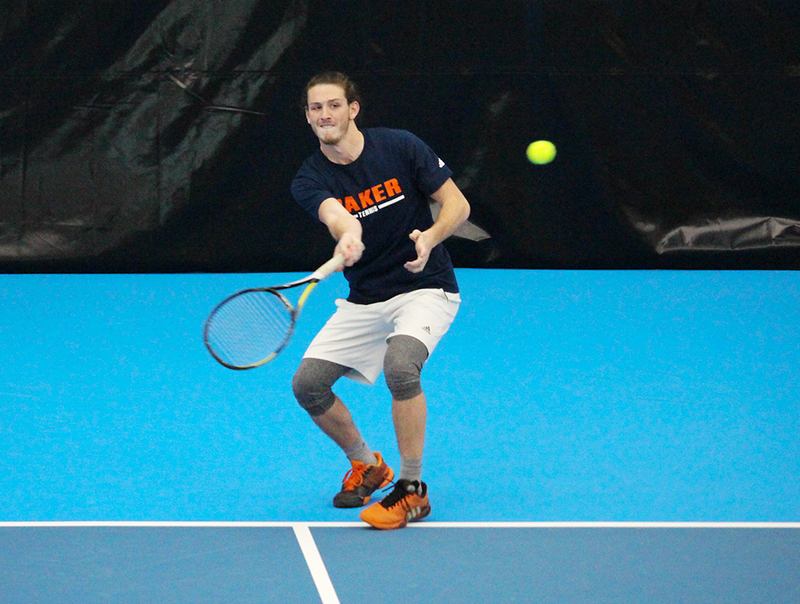 The Baker tennis teams took on McPherson College on Saturday at the Jayhawk Tennis Center in Lawrence. The No. 20 ranked McPherson women defeated the Wildcats 6-3, and the No. 18 ranked McPherson men defeated Baker 9-0. On the women’s side, the Wildcats took three singles matches. At the No. 2 spot, Brooke Barnard dropped the first set but won the second, forcing a super tiebreak that she won 10-6. In the No. 3 spot, Baker’s Sophie Robertson won in straight sets. Morgan Francis also took her match, at the No. 5 spot, to a super tiebreak, which she won 10-5. McPherson dominated on the men’s side without even allowing Baker to win a set. The closest match came at the No. 1 doubles spot, where Baker’s Blake Barnard and Austin Keberlein fell 8-5. Thomas Irick played at the No. 2 singles spot against McPherson and has high expectations for the team’s 2017 season. Rahachou was named Heart of America Athletic Conference Player of the Year in 2016, and he and Blake Barnard were named first-team all-conference for doubles. The men’s team reached the finals in the Heart tournament last season, a place they hope to reach again this season. The women’s team advanced to the semifinals of the 2016 conference tournament but fell to William Woods. With several new additions to the roster, the women also look to further their success in the conference. The Wildcats have five consecutive home matches in March and April before going on the road for their last six matches (seven for the women) of the season.